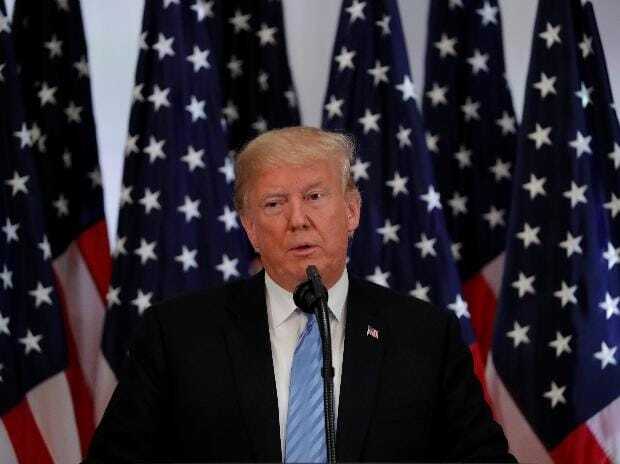 US President Donald Trump on Monday spoke to his Turkish counterpart Recep Tayyip Erdogan, where they discussed the current situation in Syria and the economic development between the two countries, a day after he threatened to "devastate" Turkey's economy if it fought with the Kurds. Taking to his Twitter handle, Trump wrote, "Spoke w/ President Erdogan of Turkey to advise where we stand on all matters including our last two weeks of success in fighting the remnants of ISIS, and 20 mile safe zone. Also spoke about economic development between the U.S. & Turkey - great potential to substantially expand!" The White House said that during the phone call, Trump discussed cooperation with Turkey to address Ankara's concerns in northeast Syria. "The President expressed the desire to work together to address Turkey's security concerns in northeast Syria while stressing the importance to the United States that Turkey does not mistreat the Kurds and other Syrian Democratic Forces with whom we have fought to defeat ISIS," CNN quoted White House press secretary Sarah Sanders saying. According to Anadolu News Agency, Erdogan backed Trump's call on withdrawing all troops from the war-torn country, saying Turkey supported the decision and extended support to the US. Erdogan said that Turkey does not have issues with Kurds and that "Turkey aims to fight all terror organisations including ISIS, PKK (The Kurdistan Workers Party) and its cross-border extensions that are a threat to its national security." On Sunday, while giving a stark threat to Turkey over the future of Kurds in the region and reiterating that Washington began the pullout of its troops from Syria, Trump tweeted, "Starting the long overdue pullout from Syria while hitting the little remaining ISISterritorial caliphate hard, and from many directions. Will attack again from existing nearby base if it reforms. Will devastate Turkey economically if they hit Kurds. Create 20 mile safe zone...."
"....Likewise, do not want the Kurds to provoke Turkey. Russia, Iran and Syria have been the biggest beneficiaries of the long term US policy of destroying ISIS in Syria - natural enemies. We also benefit but it is now time to bring our troops back home. Stop the ENDLESS WARS!" he added. Turkey views some Kurdish groups as terrorist organisations operating in the region. Apart from that, the Kurds, an Iranian ethnic group, found in parts of Syria, Iraq, Iran and Turkey, make up the majority of US-allied fighters fighting in the Syrian civil war against President Bashar al-Assad's regime. In response, Turkish Foreign Minister Mevlut Cavusoglu slammed Trump's comments, saying that Ankara is not afraid of any threat and asserted that it was not an enemy of the Kurds. "As for Donald Trump's threat language, we have repeatedly said that we will not be afraid of any threat. ... You cannot have any result from threatening Turkey economically. We need to see how we can solve this problem together. There are economic difficulties on one side and terror on the other," he said.